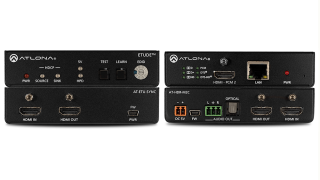 Atlona will introduce two new products for addressing AV integration-related challenges at the forthcoming ISE 2017 show, both specifically for AV systems with HDR (high dynamic range) video as well as 4K/UHD at 60Hz with 4:4:4 chroma sampling. To be presented at stand 5-S92 at the Amsterdam RAI from February 7-10, the new Atlona Etude Sync (AT-ETU-SYNC) and AT-HDR-M2C are designed to resolve AV system design and installation issues frequently encountered with audio and video format compatibility, signal integrity, and EDID communication. Both products are HDCP 2.2 compliant and support HDMI 2.0 data rates up to 18Gbps. The Etude Sync provides EDID emulation and Hot Plug Detect communication between HDMI sink and source devices. It detects and corrects for signal integrity issues associated with cabling or connections, and can resolve compatibility problems between a source and destination. In addition to addressing HDMI signal and device-related issues, the Etude Sync reports HDCP compliance at the source and sink. It can manage EDID communication with the source, by delivering EDID from the display or the Etude Sync’s internal memory. This device is suited for AV system troubleshooting as well as ensuring reliable, consistent performance. For convenience to installers and technicians in the field, the Etude Sync can be powered via USB by the included power supply, a laptop, or any available USB port nearby. The AT-HDR-M2C is an audio converter for extracting and downmixing multichannel PCM, Dolby, and DTS audio from HDMI sources. It is designed for commercial and residential applications requiring playback of multichannel source content over displays, distributed audio systems, and whole-house audio systems. The HDR-M2C features an HDMI input with pass-through, and delivers stereo downmixed audio over HDMI, two-channel analog unbalanced audio, and TOSLINK digital audio outputs. The HDR-M2C is compatible with all Dolby and DTS formats, and de-embeds HDMI audio with or without connection to a display or other destination. This audio converter includes EDID management features as well as audio volume and bass/treble controls, all available via Ethernet through the Atlona Management System (AMS), the web GUI, or a control system. AMS is a network software platform for configuring, managing, and monitoring the HDR-M2C and other Atlona IP-controllable devices over a LAN, WAN, or VPN. AMS is available free from Atlona. The Etude Sync and HDR-M2C begin shipping April 2017. The Etude Sync will be available for a suggested retail price of $249.99, and the HDR-M2C will retail for $449.99. Both products include Atlona’s 10-year limited product warranty and customer support services.